The Grumman XF5F-1 Skyrocket was an odd looking bird. It was a one-off prototype built for the US Navy with a very unusual configuration. The wing’s leading edge extended forward of the fuselage nose giving it a bizarre look. It was the first twin-engine fighter intended for carrier use, but it never saw service. The story of the Skyrocket begins in 1935 when the US Navy Bureau of Aeronautics (BuAer) first contemplated a twin-engine carrier fighter. By 1937, they believed that single-engine airplanes, with 1,000 hp (745 kW) engines, would not be much faster than the Grumman XF4F-2 Wildcat, that was ordered in July 1936. Weight less than 9,000 lb (4,082 kg). Overall speed to be as fast as possible. Stall speed of no more than 70 mph (112 km/h) (raised from 65 mph (104 km/h)). Takeoff distance of 200 ft (60 m) into a 25 knot headwind. Armament of two 20-mm cannons and two 0.30 caliber machine guns. Pratt & Whitney R-1535 radial engine. Pratt & Whitney R-1830 radial engine. Grumman XF5F-1, powered by two 750 hp (560 kW) Pratt & Whitney R-1535-96 engines. Vought XF4U-1, powered by one 1,850 hp (1,380 kW) Pratt and Whitney XR-2800 engine. Bell XFL-1, powered by one 1,150 hp (857 kW) Allison V-1710 engine. 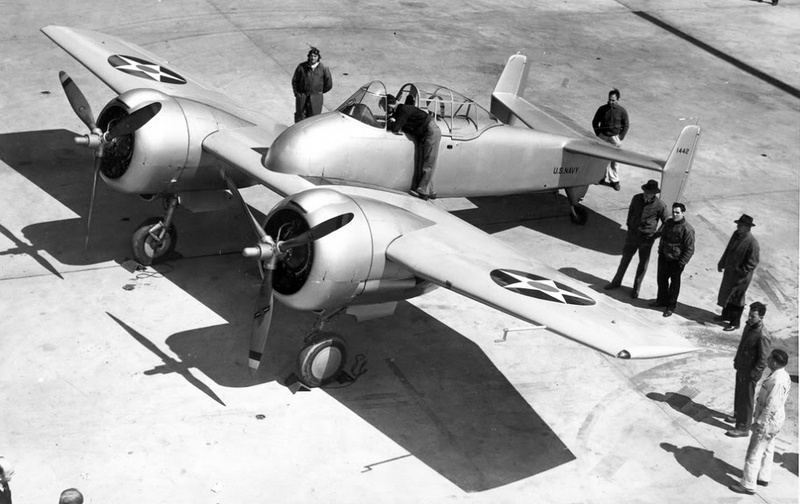 Although the Vought XF4U-1 did not include an engine originally specified, they were still awarded a contract for a prototype since the XR-2800 was Pratt & Whitney's latest development. Grumman also changed engines to the Wright R-1820, because the Pratt & Whitney R-1535 was no longer being developed with a two-stage supercharger as specified in the 1938 proposal. The Wright R-1820 had a larger diameter and would decrease forward and downward visibility, but the Navy reluctantly agreed to the change to expedite the development of a twin-engine design. Originally, the Navy contemplated using the Allison V-1710 liquid-cooled engine, but the liquid-cooled Allison engine was later rejected as being too vulnerable to combat damage. Liquid-cooled engines stop running very quickly after they lose their coolant and bailing out over a wide ocean is a lot more precarious than bailing out over land. When the XF5F-1 was finally completed, it made its inaugural flight on April 1, 1940 and was flown by Grumman test pilot B.A. Gilles. It demonstrated good flight characteristics and attained a maximum speed of 383 mph (616 km/h) at 20,000 ft (6,096 m). However, problems developed almost immediately. The engine oil cooling system was inadequate, the aircraft had excessive drag and the landing gear doors did not close properly. Grumman made seventy flights to make corrections before delivering it to the Naval Air Station at Anacostia on February 22, 1941. However, by this time, the Vought XF4U-1 was already delivering speeds up to 404 mph (650 km/h). The Skyrocket’s only outstanding feature was its 4,000 ft/min (20.32 m/sec) rate-of-climb. The rate of climb of the XF4U-1was 2,660 ft/min (13.51 m/sec) and the Bell XFL-1 was 2,630 ft/min (13.36 m/sec). With a slower overall speed, that was even slower than its heir apparent, the single-engine F6F Hellcat. The handwriting was on the wall. After Vought received an order for 584 F4U-1s on June 30, 1941, it quickly became apparent that the Skyrocket would not go into production.3 Without a production order, the XF5F-1 was relegated to being a flying test bed for the Navy. There would be no glory destined for this bird. The Skyrocket was the first Grumman aircraft with folding wings. It was the first Grumman aircraft with folding wings. The tail assembly had twin fins and the landing gear wheels retracted into the engine nacelles. The wings folded outboard of the engines for easy stowage on the carrier flight deck. It was powered by two 1,200 hp (895 kW) Wright XR-1820-40 and -42 engines driving three-bladed counter-rotating propellers. However, the landing gear was structurally weak and the problem of pilot visibility had not yet been resolved. Grumman’s proposed armament was four 23 mm Madsen cannons and two 0.30 caliber machine guns, but the cannons never became available. Four 0.50 caliber machine guns would substitute for the cannons, but in the end the armament was never installed. It was finally stricken in December 1944 after two landing gear failures. The aircraft had made 211 flights and flying time totaled 155.7 hours. 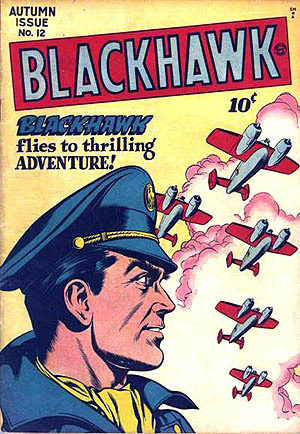 The only fame for the Skyrocket would be in the comic book “Blackhawk.” Due to its distinctive shape, the Skyrocket became the "super weapon" of the 1940's comic book hero Blackhawk. Blackhawk was a small team of World War II-era ace pilots of varied nationalities that operated from a hidden base known as Blackhawk Island. They flew Grumman XF5F Skyrockets and early episodes pitted the team against the Axis powers. Readers of that time saw an entire squadron of Skyrockets fighting in each episode, when in reality only one aircraft was ever built. The Blackhawks flew the Skyrocket from their first appearance in 1941 until about 1949. The Skyrocket’s unique design made it easily recognizable and it became amazingly well known for a plane that never went into production. An offshoot of the XF5F-1 was the land-based XP-50 interceptor. The XF5F-1was ordered by the US Army Air Corp on March 11, 1939 under Circular Proposal 39-775. It was the first Grumman fighter developed for the army. The major differences were a longer nose to accommodate two 20-mm cannons and two 0.50 caliber machine guns and a tricycle landing gear. Provisions were also made for self-sealing fuel tanks and armor protection for the pilot. It was powered by two 1,200 hp (895 kW) Wright R-1820-67/69 turbosupercharged radial engines driving three blade propellers. During early tests, performance was markedly better than the XF5F-1 and the turbosupercharged engines provided better performance at medium and high altitudes. On March 14, 1939, the aircraft was damaged in a landing accident and was repaired and continued with service trials. After the crash, it lost out to the XP-49, a revised version of the Lockheed P-38 Lightning. The XP-49 was powered by two experimental Continental XI-1430 Hyper engines, but this project was also cancelled when it was found that the new engine did not provide any more power than existing engines. Also, military planners were now beginning to focus their attention on the development of jet aircraft and engines. 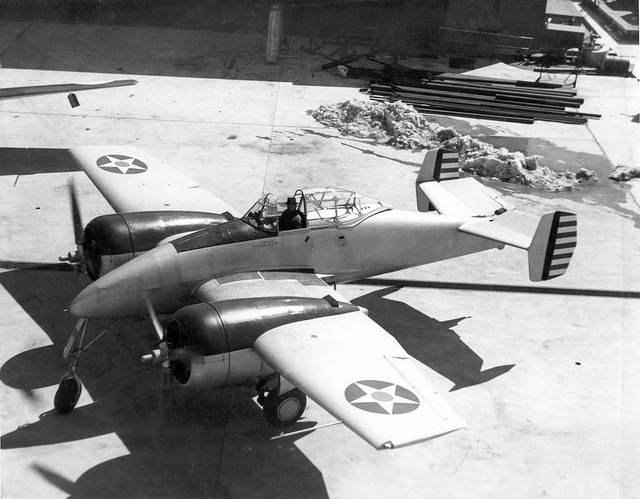 No other Grumman aircraft, conceived strictly for the military, would be ordered by the US Army Air Force. It wouldn’t be until 1981 that Grumman finally succeeded in receiving a contract from the USAF for the X-29 research aircraft. Grumman finally got it right, but it was too late for the war. The knowledge gained during the development of the XF5F and XP-50 was applied to Grumman's new G-51 proposal, which was to eventually become the highly successful Grumman F7F Tigercat. 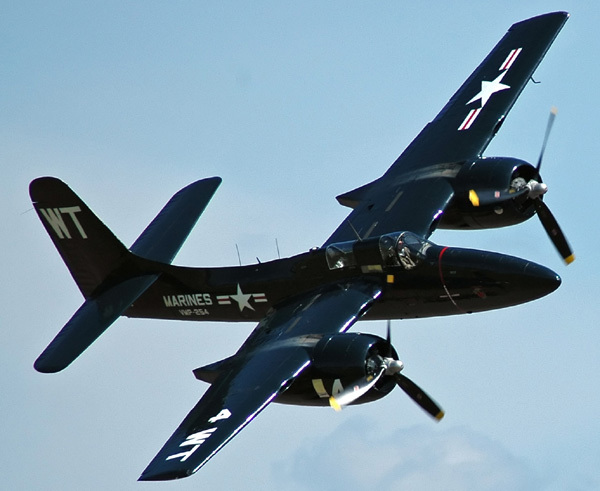 Although the Tigercat was too late to serve in World War II, it served as an attack-aircraft and night-fighter during the Korean War. four 0.50 caliber machine guns. René J. Francillon. Grumman Aircraft since 1929. London: Putnam Aeronautical Books, 1989. 142. Earl Swinhart. F6F Hellcat. The Aviation History Online Museum. Gordon Swanborough and Peter Bowers. United States Navy Aircraft Since 1911. Annapolis Maryland: Naval Institute Press, 1990. 449. Lloyd S. Jones. U.S. Fighters. Fallbrook, California: Aero Publishers Inc., 1975. 124. Created December 28, 2015. Updated February 6, 2016.